The irony of a post detailing how to make (vegan) fake blood is not lost upon me, but it’s October and therefore my favorite month, so it’s 100% fitting. Halloween is my Christmas. As soon as September hits, I start busting out the seasonally-appropriate music (AFI, Calabrese, Misfits, etc) and begin planning out costumes and decorations to satisfy my boyish love of the season. I have a long-time love for all things horror, reading every Stephen King and Clive Barker book I could find in junior high and high school, and watching every scary movie I could rent for as long as I’ve been able. Further evidence of my love for horror movies can be seen over in the Reddit Horror Club, of which I cohost a weekly podcast with my good friend Matt SaintMort. I love horror movies so much that I started a horror-themed 50s rock band called Survivor Girl, and we will be hosting a Slasher Sockhop here in Akron at the end of the month. Beyond the obvious cross-promotion, there is a valid reason I bring all of this up - I had the "brilliant" idea to have a Blood Booth at the sockhop... Before realizing I’d have to make the blood for it. I figured it would be a cinch, until I started scoping for a recipe I liked. I had originally hoped for an edible, washable option, but as far as I can tell, you can do one or the other, but not really both. I would love to be proven wrong, but for this post, I went the edible route since the Spoon & Shovel is, y’know, primarily about food. One last thing before the madness - this recipe is more involved due to the vegetable juice reduction, so plan your cook-time accordingly; also, you will want to keep your blood refrigerated or frozen until needed, as the vegetable juice dye probably degrades faster than store-bought food coloring. I assume 2-3 days in the fridge before use is fine. Now that that’s covered, on with the show! First, pick out a sharp knife and chop your beets - leaves, stalks and all! Chop the cabbage next (roughly half of a small head) and put your prepared veggies in separate stockpots. Add 4 C. fresh water to each pot and bring to a rolling boil, roughly 5-10min. Let both pots boil for ~10min, then turn the heat down to a low boil (medium heat) for the next hour. Keep an eye on both pots and add water if either boils off too much water; I added an extra 2 cups to the cabbage when making this, but did not need to add to the beets (possibly due to different heating element size). Run a cooking fan or open a window while cooking the cabbage, if you can… The smell can get quite pungent! After about an hour, pour off the liquid from each stockpot into separate containers and discard/compost the spent vegetables. Give your veggie dyes a look, and if they are still thin and you can easily see through them when held up to the light, put them back in the stockpots to cook down on low/medium-low heat for another 15-30min. I did this for both the beet and cabbage, and came out with ~1 C. beet dye and ½ C. cabbage dye. I could have cooked the beet down further, and might do so next time. The more concentrated your dye, the thicker your fake blood, so less liquid is obviously better. Once you’re happy with your dye concentrations, get out a glass bowl or container (so you can easily monitor your blood’s color and consistency) along with the corn syrup and dry ingredients. Combine the beet dye and half of your corn syrup (16 oz./2 C.) with a small hand whisk, followed by the cornstarch and cocoa powder. Add the rest of the corn syrup and whisk until there are no lumps; bubbles on top are fine, though. Now, begin adding your cabbage dye SLOWLY. You won’t be using all of the dye, as you just want it to deepen the red from the beets. I used less than ¼ C. (4 T.) of mine, and put the remaining liquid in the freezer for later batches of blood. You also don’t want your blood to taste very cabbage-y… And it will if you add too much, so use your eyes and tastebuds to decide when your blood’s color and consistency is to your liking. 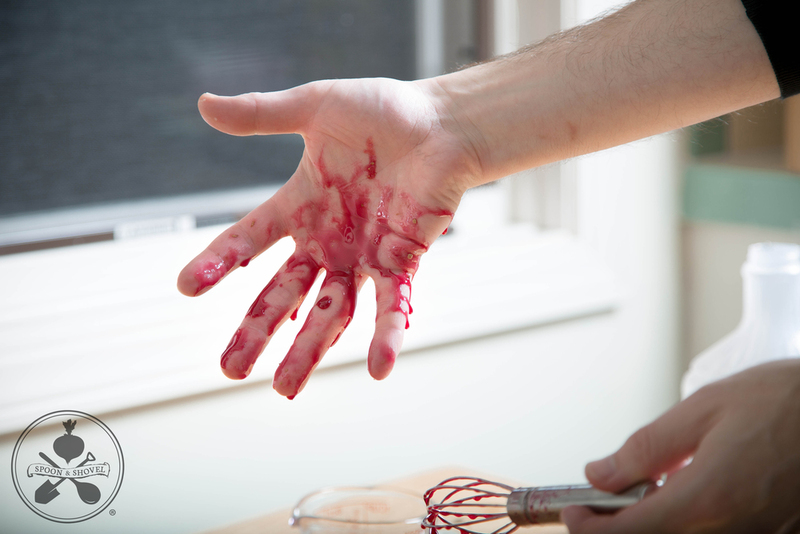 Once your blood looks good in the bowl, do a skin test in good lighting to make sure it drips right and looks realistic. I also did a cloth test on a dark towel I didn’t mind staining a little (never fear, there are ways to remove beet stains) to see how it would look on clothes. If it’s too thin, whisk in more cornstarch, ½ T. at a time. If the cabbage flavor is more noticeable than you’d like, or you just want more chocolate flavor to your blood, feel free to add more cocoa powder instead, also in ½ T. increments.